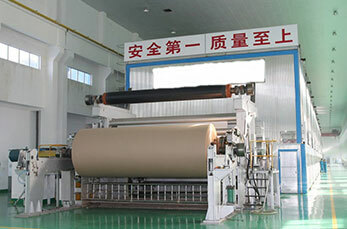 Leizhan 50t/d kraft paper making project can be divided into two main categories: pulp production and paper production. Firstly, waste paper is transported to ZDSD24 D type hydrapulper for pulping by chain conveyor. Secondly, the paper pulp will be conveyed into ZSC4 high density cleaner to remove various heavy impurities in the paper pulp. Thirdly, paper pulp entered into the ZNS0.6 first stage mid consistency coarse screen for coarse and fine screening. Then, the paper pulp will be conveyed to ZSC4 mid density cleaner and ZNS0.9 mid consistency fine screen for a second stage of pulping to ensure the high quality of the fine pulp. Leizhan 50t/d kraft paper manufacturing system has an product capacity of 50t/d of recycled fluting in the basis weight range of 160 to 210g/m2, the design speed is 100m/min.